it’s the holiday season! add some serious glitter to your eyes! using the shu uemura WKW holiday collection, i created a look for shu uemura using colours from both the holiday palettes as well as the glamourous dance in glitter premium false lashes. i wanted to create a look that was simple, bold yet soft to show case the lovely colour atelier eyeshadows. the shu uemura eyeshadows have great colour pay-off because they are so pigmented. i didn’t need to use a cream base to create the intense blue. photographer mark darren mui directed and captured a great shot with model stephanie nicholson. the perfect soft lighting made for a perfect photo. For dramatic holiday eyes use brush 12 and pressed eyeshadow in ME medium blue 686 all over the lid. Then use brush 10 and P dark blue 696 to create a gradation from the lashline up to crease. Follow by using P dark purple 781 and brush 8HR and blend into the crease. Use G glitter in the inner corners of the eyes. Line eyes using drawing pencil ME blue. 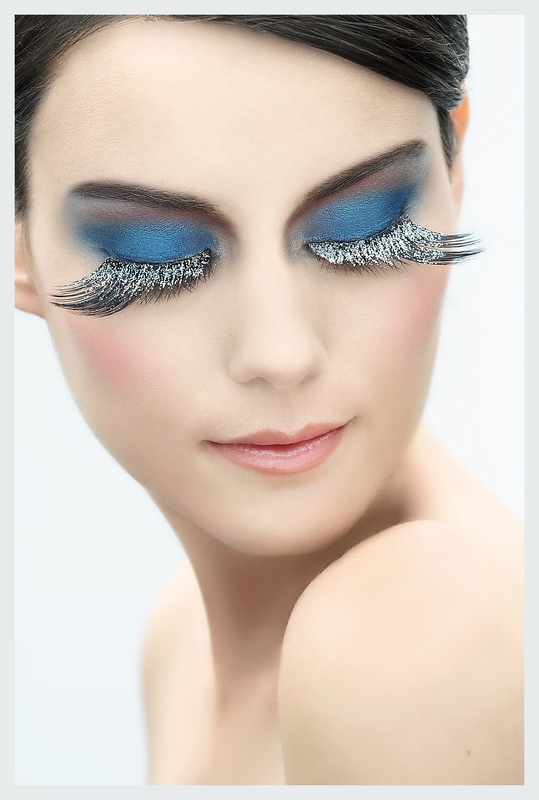 Complete the eyes with the dance in glitter false lashes. For lips, use rouge unlimited glitter fuse.